To evaluate changes in HbA1c following specialist referral amongst patients with type 2 diabetes, using the proprietary software Audit 4. More than 50 Australian endocrinologists are using the proprietary clinical software program, Audit 4 (Software 4 Specialists, S4S, Australia), a subset of whom have formed the Diabetes Informatics Group (DINGO) to pool de-identified data for audit purposes. Data from patients with type 2 diabetes was extracted. Inclusion criteria were: initial age <70, baseline HbA1c >7% with at least another HbA1c in the next 2 years. HbA1c results were analysed in 3-6 month time blocks. Where there was more than one HbA1c in a time block the result was averaged. Data was analysed using a linear mixed effects model. Of 10756 patients in the dataset, 1379 fulfilled the inclusion criteria. Mean age at initial consultation was 55±12 years. The baseline HbA1c was 9.1±1.7% and BMI 32±10. 58% were male, 42% female. 81% were on oral hypoglycaemic agents. 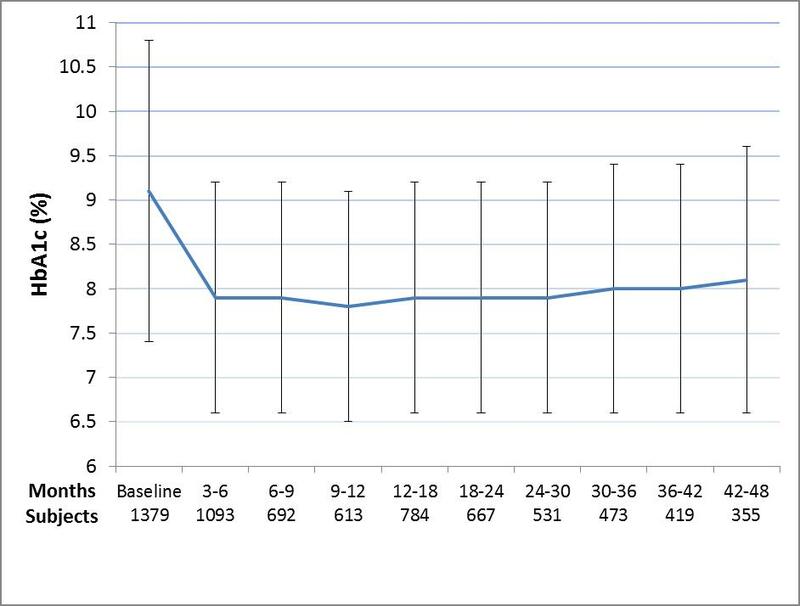 There was a 1.3% improvement in HbA1c in the first 3-6 months following referral (p<0.0001), after which no further improvement occurred. This effect was maintained with minimal loss of control at 4 years (Figure). At 3-6 months, 24% of patients achieved target HbA1c ≤7% with no subsequent increases in the proportion reaching target. Endocrinologists are often referred the most challenging patients who have not achieved glycaemic targets despite use of oral agents and/or insulin. Our data demonstrated that referral to specialist care improves glycaemic control with an effect size similar to adding a sulfonylurea or metformin and more subjects achieve HbA1c targets. Moreover, the improvements in HbA1c are sustained over the medium-term. Referral of patients with type 2 diabetes to endocrinologists reduces HbA1c, increases the proportion of subjects achieving targets, and the effect is sustained over the medium term. Figure: HbA1c following referral to an Endocrinologist. Data depicted are mean±SD.